The sight's and smells encountered while shopping at Benedito's are bound to make your mouth water. 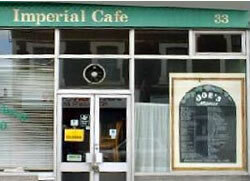 So, why not pop down the road to the Imperial (Joe's) Cafe for that much needed refreshment. Treat yourself to a full meal, a snack or one of Joe's all day breakfasts.